The expanded fifth edition of Environmental Hazardsprovides a balanced overview of all the major rapid-onset events that threaten people and what they value in the twenty-first century. It integrates cutting-edge material from the physical and social sciences to demonstrate how natural and human systems interact to place communities of all sizes, and at all stages of economic development, at risk. It also shows how the existing losses to life and property can be reduced. Part I of this established textbook defines basic concepts of hazard, risk, vulnerability and disaster. Critical attention is given to the evolution of theory, to the scale of disaster impact and to the various strategies that have been developed to minimise the impact of damaging events. Part II employs a consistent chapter structure to explain how individual hazards, such as earthquakes, severe storms, floods and droughts, plus biophysical and technological processes, create distinctive patterns of loss throughout the world. The ways in which different societies make a positive response to these threats are placed in the context of ongoing global change. In this extensively revised edition: An entirely new and innovative chapter explains how modern-day complexity contributes to the generation of hazard and risk Additional material supplies fresh perspectives on landslides, biophysical hazards and the increasingly important role of global-scale processes The increased use of boxed sections allows a greater focus on significant generic issues and offers more opportunity to examine a carefully selected range of up-to-date case studies Each chapter now concludes with an annotated list of key resources, including further reading and relevant websites. Environmental Hazards is a well-written and generously illustrated introduction to all the natural, social and technological events that combine to cause death and destruction across the globe. It draws on the latest research findings to guide the student from common problems, theories and policies to explore practical, real-world situations. 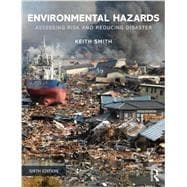 This authoritative, yet accessible, book captures both the complexity and dynamism of environmental hazards and has become essential reading for students of every kind seeking to understand the nature and consequences of a most important contemporary issue.